My how the data landscape has and continues to change – lot’s of NEW big words and concepts. Got it! Programmatic has certainly changed – the following article by Brian O’Kelly CEO of AppNexus offers some insight as to how things are shaping up in terms of programmatic. Although I find the terms “extinct” and “evolved” to be too neodarwin for my liking there are some fascinating points to consider. “Decisioning” (ah I love the sound of it) for sure or what some of us call “the process of real time data driven decisions”. It is a good read and as always thoughts and comments are welcome! Internet of Things not ready for prime time….but here’s a glance! One word…standardization, well… it’s a big word I know but it is one we tend to visit frequently. Is it that we are slow learners? It does seem that way. Although there are complex issues – I would posit companies are vying for the golden egg experience…you know when a company reaches that status of going from a noun to a verb. At stake are millions and millions of dollars – however when it comes to smart devices some are smart and cool for sure but in terms of an actual ecosystem…bastardized, until we have standards harmony will not exist. One of the reasons I am watching closely but not taking seriously at the consumer level…it’s just not ready for prime time. As an ideator myself I know that the a path of better ideas exist with each iteration within the growth process – so until then we will have to be patient; but take a look at the slide-show from Pew Research of what the future of Internet of Things (IoT) might look like. I would like to tell you about a little journey I am on as of late- in the Seattle area…and by the way this is for posterity so grab your coffee and pull up a chair! Back in September I was having the typical project closure meeting and was on Skype with one of my contract techs after all other attendees had left and let me just say, at the time I had no idea how much that conversation would alter my thinking about connections. Go ahead and bake on the word “connections” for a minute while I offer full disclosure – I am a connector…always have been and while I do have my close circle of friends I can never know too many people. Of course in my circles there are many who are far more connected socially and professionally and a bunch that have consciously chosen to forego digital connections altogether…it’s their choice either way I’m cool. Anyways, towards the end of our chat the tech I will call John told me that he was moonlighting for Uber. I did not know anything about Uber at the time and so he proceeded to explain how Uber worked and about the peeps he had met during his down times in between projects…needless to say I was intrigued. That is when I started putting together this idea to utilize the Uber service as a way to leverage a captive audience on my turf. And I wasn’t the ONLY one intrigued with this idea! A couple of professional networking companies were also interested in the “connection-fiber” potential during those treks from point A to point B. For the last month I have been working the Uber/Lyft platform to that end and gathering qualitative data which I will share more on in later posts. Sure, I am on LinkedIn, go to mixers, and belong to local professional associations and have met plenty of people along the way but what I hadn’t noticed until recently is that I am doing ALL of the same things that everyone else is doing. Interestingly, our digital persona and face to face social outings is the time and place we put on our “persona we want everyone to believe about us”. With that said, I don’t think anyone can underscore the value of catching a person with their guard down, in the beginning, middle, or end of their work day spilling their guts on what they are working on…or not. That is the point isn’t it? Having been a client-facing professional most of my life and a contracting/consultant and project manager the last decade…I like many of you, have gone to a customer site, have been interviewed, and have negotiated deals where from a psychological standpoint the ground was uneven. Heck I have interviewed many folks myself at Starbucks and Tully’s through the years which served as a neutral ground at best, but networking via Uber on my turf is showing great potential. I have a hundred or so business cards from the last several weeks, have handed out plenty, and have been asked to coffee to discuss a startup idea with a company in Pioneer Square. I have met business owners, private equity folks, lots and lots of dev’s (this IS Seattle after all), statesmen and women, healthcare, and IT professionals, restauranteers to name a few. I have even schlepped a few college students (hey, you never know who the next Mark Zuckerburg will be). Driving has also served to keep me apprised of the latest buzz and there has been plenty in the last several weeks in Seattle. If there is a way to sum up my thoughts on the social phenomenon at this stage is that “Herd Theory” works. As a marketing strategist guy I’ve listened to just about every known Social Media Marketing (SMM) expert and a common theme is echoing in my ears in terms of success in the social media marketing space. 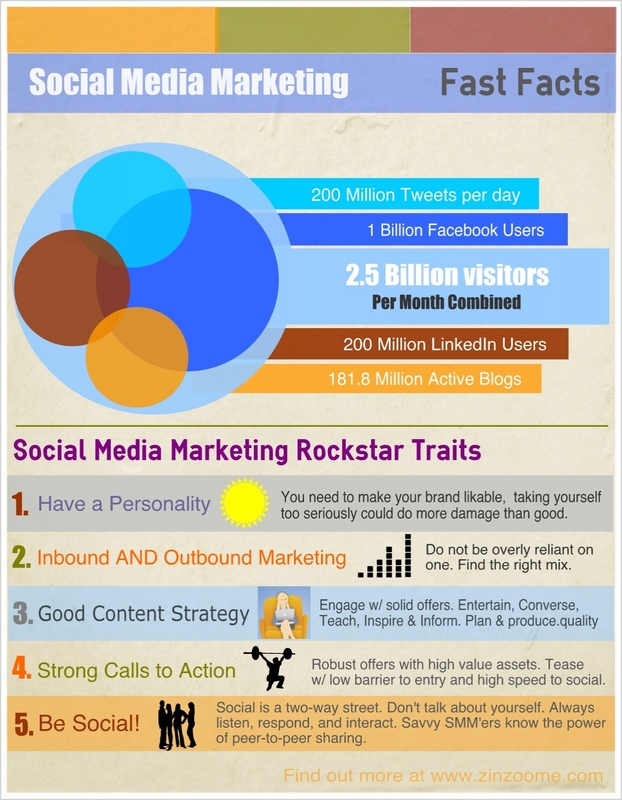 Common traits of the Social Media Marketing Rockstars I have listed in the following infographic and some quick Facebook, Twitter (which is in Pre-IPO status), LinkedIn, and the Blog power engine usage stats all provide powerful evidence that SMM is an important facet of any marketing plan. To your success! Fab 5 – News Du Jour! How much time do you spend down the information rabbit hole? Is it super easy to get lost or take off on a tangent? If you are feeling a bit lost or not sure where to start in terms of utilizing info that will bring value to your business you are not alone. Along with our Fab 5 top articles of the day, here are some tips that will help you get the most from your readings and stay atop the information deluge. 1. Relevance – there is a ton of fascinating research out there enough to bury Mt. Everest, however much of it may not add value to your business or be relevant to growing your customer base. When researching, be very specific and focused on relevant information. You may want to create a list of questions or create a template that can help guide your research. 2. Digest/Absorb – allow time to digest information, bring in others with different opinions, ideas, etc. and view from different angles. Truth is, a couple of articles on social media marketing does not an expert make. Jump in too early without a well thought out strategy, you may do more harm than good. Secondly, you have to learn what something is before you can decide if it meets the criteria for tip #1. 3. Know your customer/potential customer – Who are they? This is your Raison d’être. Deep dive and really get to know your customer and how they are evolving. Who is your listening and reading audience. Without having a good grasp of the “who”, Tip #1 will be a guessing game. With all the information available online the “see what sticks” marketing approach is a no win in today’s competitive marketplace. We would love to hear your comments on the information that you find most useful and insightful or just a good old pat on the back! About Those Job Boards – Have an Opinion? Despite great amounts of energy on the front end for evaluating applicants, testing and personality profiling, etc. the average tenure for professionals and salary workers in 2012 was 4.6 years which is up from 4.4 years avg. in 2010 according to the Bureau of Labor Statistics. 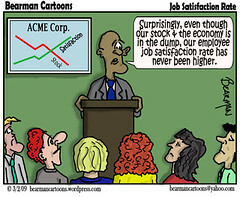 (http://www.bls.gov/news.release/tenure.nr0.htm) I would posit the rise in tenure is indicative of slow job growth recovery and uncertainty in the private sector vs. better hiring practices, job satisfaction, or improvements in corporate incentives. There are more ways than ever to track down new talent – are the big job boards still relevant or useful in your opinion? How would you answer the following question regarding CareerBuilder or Monster? Would appreciate your valuable input. The 7 “Deadly” Digital Marketing Types (not really, for effect) – Which One Are You? So which profile/type below describes you? Wait…let me ask this, how would your inner circle describe you? The infographic below might help identify your tendencies or shall we say obsessions in the digital marketing realm. Intervention…maybe? Did you chuckle when you ID’d yourself? I know I did. I fall into at least two categories. I do tend to share “loudly” and often so the megaphone profile seemed apropos however let me just say DATA WHIZ! (I’m yelling right now!) really is my Achilles heel. I am constantly hoarding data. Data in the aggregate is coming at us in tidal waves (some even have really cool dashboards) and what I am hearing from business owners and marketing professionals alike is the difficulty in keeping pace and identifying the highest priority indicators relevant to the core marketing strategy. In other words extrapolating the key info that packs the most punch. Hence a clear strategy in place might alleviate some of the data clutter/chaos and may even stymie the nervous tic of your own “data whizzer(s)”. I do often drop into webinars of marketing professionals to absorb and glean new and improved best practices, which also adds to my tool chest – however, following the #hashtags on Twitter I hear many a “snarky marketer” goings-on mid-web session to the point of distraction. I wonder who would be honest enough to fess up. So where do you fit in? Do you think these insights would be suggestive of findings we might expect on a self-assessment tool such as DISC Profile or Meyers-Briggs? Good tips for Social Media and Storytelling. Recent reviews by rudy b.